40 squares puzzle of Nicotiana flower. 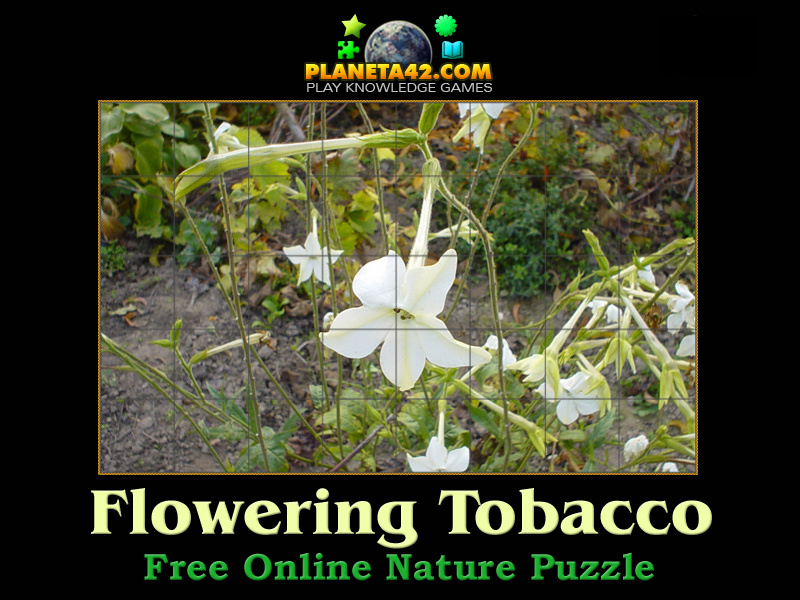 "Nicotiana Puzzle" is a free online mosaic puzzle with picture of Nicotiana plant in its flowering period. An industrial plant with white cone flower. The game will run in most web browsers on average desktop computers, laptops and tablets. This is an exciting way to find a flowering tobacco plant. Flash mosaic game. Nicotiana is a genus of herbaceous plants and shrubs of the family Solanaceae, that is indigenous to the Americas, Australia, south west Africa and the South Pacific. Nicotiana species, commonly referred to as tobacco plants, are cultivated as ornamental garden plants. N. tabacum is grown worldwide for production of tobacco leaf for cigarettes and other tobacco products.